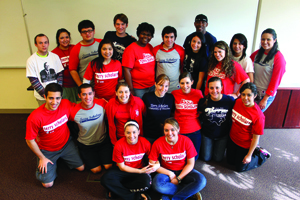 The Terry Foundation is a Houston-based philanthropic organization that provides scholarships for outstanding Texas students to attend in-state public colleges and universities, including the University of Houston. Established in 1986 by Nancy & Howard Terry, the foundation has awarded scholarships to thousands of Freshmen and transfer students from all over the state. For Freshmen students, the Terry Foundation Traditional scholarship amount is based on the cost of attendance (tuition, fees, books, room and board, and miscellaneous expenses), is adjusted individually based on additional sources of financial support, and is renewable for eight semesters of undergraduate study. For Transfer students, the Terry Foundation Transfer scholarship will cover 65 percent of the UH cost of attendance—with a minimum award of $19,000 per year—and is renewable for six semesters of undergraduate study. In addition, each Terry Scholar is eligible to receive a study abroad stipend in the amount of $5000 to fund their study abroad experience. Between the 2015-17 academic years, 66 Terry Scholars received over $600,000 from the Terry Foundation to fund their study abroad experiences. Apply and be accepted to the University of Houston no later than January 4, 2019. Essay 1: What was the environment in which you were raised? Describe your family, home, neighborhood, or community, and explain how it has shaped you as a person. Essay 2: In approximately 500 words, describe an example of your leadership. Be sure to describe your actions and the actions of those around you and to explain what you accomplished. Two letters of recommendation, on official stationery, addressing your academic and leadership abilities. Letters will be submitted electronically by your letter writers. You will provide the names and emails of your two recommendation letter writers. Once you submit your application, the letter writers you have listed will be emailed and requested to upload your letter through an online form. Important: All letters of recommendation must be submitted by the application deadline (January 11, 2019). Please make sure your letter writers have your UHID and email address, as they will need it when submitting your letter. Please note: You are still expected to ask potential letter writers if they would be willing to write a letter of recommendation on your behalf prior to submitting this form. A sealed, official high school transcript mailed to the address below. Mailed transcripts must by postmarked by January 11, 2019. Unofficial college transcript(s), if applicable. If you have more than 15 hours of college credits from a dual credit program, community college, or university (excluding AP/IB credits), you must also submit your unofficial college transcript. You can submit this transcript via the online application. Complete the Free Application for Federal Student Aid (FAFSA) by February 9, 2018. Apply for on-campus housing once you have been admitted to UH. Freshman Terry Scholars are required to live on campus. On-campus housing for Terry Scholars is located in Honors housing in Cougar Village I. Current continuous resident of the State of Texas for at least 3 years as of June 2019. Submit a completed application by noon on March 14, 2019. Submit official transcripts from all previously attended institutions. Mailed transcripts must be postmarked by March 8, 2019.
Letters of recommendation are NOT required for the Transfer Application, but up to one letter can be accepted. The letter of recommendation will be submitted online via an electronic form. You will provide the names and emails of your recommendation letter writer in the application. Once you submit your application, the letter writer you have listed will be emailed and requested to upload your letter through an online form. No mailed letter of recommendation will be accepted. Complete the FAFSA (recommended) by April 1, 2019. Apply and be accepted to the University of Houston for Summer or Fall 2019 no later than March 8, 2019. Your application will not be completed until you are admitted to the University of Houston as a transfer student. If you have any questions, please contact the University of Houston Terry Coordinators at terry@uh.edu.